When longtime San Francisco resident Matthew Dickey received an eviction notice last year, he stood to lose more than just his housing. Being evicted from his apartment would price Matthew out of living in the city that he has called home for more than three decades. He faced losing his entire community. And he faced losing access to the essential HIV health services that he receives in San Francisco. Matthew reached out to ALRP for help. 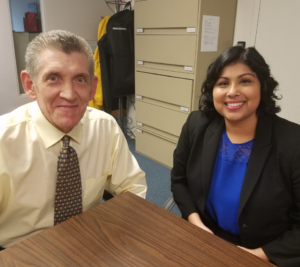 He was immediately matched with Senior Housing Attorney Zeenat Hassan, who forged a path for fighting the nuisance claim behind his eviction notice. Hassan learned that Matthew’s landlord had been eager to oust him from his apartment. When an accident occurred in the unit while Matthew was out of town, his landlord seized the opportunity to blame him for the damage and justify evicting him. The problem, of course, was that the accident was not Matthew’s fault. In one of ALRP’s most contentious cases to date, Hassan undertook a mountain of discovery and depositions, even bringing on an expert witness to comb through the details of the accident. After months of litigation, Matthew and his legal team were ready to take his case to trial. Before it came to that, however, his landlord agreed to settle. Matthew would stay in his apartment. “ALRP helped me stay in my housing so I could stay in San Francisco where I’ve lived for 31 years,” said Matthew. To add to the victory, Matthew’s apartment would also receive much-needed renovations that the landlord had been putting off in an attempt to force Matthew out. With ALRP’s help, Matthew was able to hold on to life as he knows it. He kept his housing, his health coverage, and his community. He kept his home.